*even my husband likes these. these tasty little bites can be made while you are roasting something else. they take less than 20 minutes to roast, so you can time them to be done with the rest of the meal. preheat oven to hot (225c or 450f) and move one of the racks to the bottom. slice sprouts in half (north to south), removing any yucky outside leaves. slice off the base if it’s hard and discolored. look to see if they are done. that means, a little brown, not burnt. 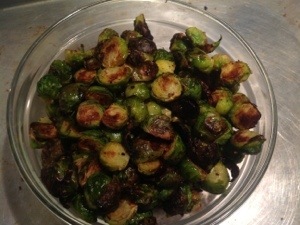 Before or after roasting, you can grind some fresh pepper on the sprouts. you can also brighten the flavor with a squeeze of lemon juice (that’s about 1 tsp). I like these hot or cold. Enjoy! Posted in Recipes and tagged cruciferous, greens. Bookmark the permalink.